Published: April 15, 2015 at 10:08 a.m. Updated: April 15, 2015 at 07:12 p.m. In 1974, the Dallas Cowboys missed the playoffs for the first time in nine years. Though we had six Pro Bowlers that season, we finished 8-6, which left us in third place in the NFC East. In 1975, we went right back to the postseason, jumping to 10-4 and making it all the way to Super Bowl X -- with a roster that included 13 rookies. That's as good an example as any of a strong draft promptly turning around a team's fortunes. It's not like our cupboards were completely bare; we did have those Pro Bowlers, after all. But the infusion of talent we got in the 1975 draft -- a class that included two first-round picks, one future Hall of Famer (defensive tackle Randy White) and five future Pro Bowlers (White, tackle Pat Donovan, linebackers Bob Breunig and Thomas Henderson and guard Herbert Scott, who started as a rookie) -- just helped so much. 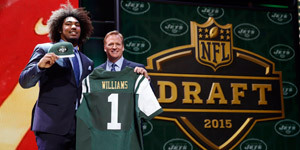 As the cacophony of hype ahead of the 2015 NFL Draft approaches fever pitch, it can be helpful to remember what's beneath all the crazed speculation and anticipation: The draft is a legitimate chance for teams to significantly boost their prospects for the upcoming season in one fell swoop. Of course, while everyone wants to do well in the draft, some teams are more desperate to ace their picks than others, whether because they need to make the most of a closing playoff window or they're driven to end a long stretch of futility. Below are the seven teams with the most riding on the 2015 NFL Draft, counting down from No. 7 to No. 1. 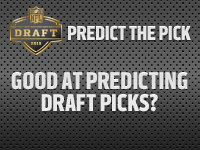 NOTE: Click on team names to see a complete list of draft picks. If Atlanta is going to be able to do anything in 2015, the Falcons must locate a pass rusher. Past attempts to address this problem via free agency -- including the 2013 signing of Osi Umenyiora, who had 2.5 sacks in 2014 -- have failed. And while last year's decision to take offensive tackle Jake Matthews sixth overall shored up another position of weakness, it puts even more pressure on the team to find someone who can rush the quarterback this year. As I explained last month, the Steelers need to keep focusing on defense if they want to maximize the rest of quarterback Ben Roethlisberger's prime. Defensive back Troy Polamalu, who retired last week after a 12-year career, is probably the last defensive player Pittsburgh drafted who was truly exciting -- and that happened back in 2003. The Steelers have tried to rediscover that magic over the years since, taking first-round swings at guys like Cameron Heyward and Jarvis Jones; last year's first-round pick, Ryan Shazier, showed potential during an injury-riddled rookie campaign. But at this point, the defense is still in need of significant attention in the draft. With the exception of 2011 first-round selection J.J. Watt, the Texans haven't drafted all that well lately. More than anything, they have to make up for last year's first overall pick, Jadeveon Clowney, who remains a question mark coming off an injury-marred debut campaign. While it's too early to call Clowney a bust, the fact remains that Houston hasn't gotten anything out of the No. 1 pick in the 2014 NFL Draft, and that will set a team back. The Texans need to pay more attention to defense this year, with corner as their biggest area of need. I think coach Bill O'Brien is one of the sleeping giants in this league; he can make magic out of pretty much anything he's given, roster-wise. He looks like one of the best new head coaches we've had in the NFL in some time. I think he's looking for a third-round type to add receiver depth, and to find a corner early on. He and the Texans might also want to consider looking for a linebacker who could one day serve as Brian Cushing's replacement. It's tough to build up a franchise when you essentially miss on five first-round picks over a span of three years. Trent Richardson and Brandon Weeden (drafted in 2012) are no longer with the team, while Justin Gilbert and Johnny Manziel (2014) haven't looked much like contributors; Barkevious Mingo (2013) has been the best of the bunch thus far, and he hasn't really lived up to expectations. If the Browns are ever going to turn things around, the 2015 NFL Draft -- in which they again have two first-round picks -- would be a great place to start. That said, I don't think Cleveland should necessarily play it safe. General manager Ray Farmer and the rest of the Browns' brass should do what they can to get the talent they want -- and if that means trading up to select quarterback Marcus Mariota, then that's exactly what they should do. I'll grant that this notion might seem counterintuitive, given Cleveland's decades-long stretch of horrendous luck with quarterbacks. But if you think someone's capable of being the guy, then you need to land him, whatever the cost; I'd gladly give up a 12th and 19th overall pick to grab a franchise signal-caller. Personally, I think Mariota's going to be good, even if he doesn't deliver elite production right away -- and it's not like Cleveland's QB losing streak can last forever, right? Of course, if the Browns don't like Mariota that much, they could help themselves greatly by using one of those picks on a promising young receiver. The Cowboys are where they are -- coming off a 12-4 season as the reigning NFC East champions -- largely because they did such a great job drafting over the past few years, building a stellar offensive line that powered the NFL's second-best rushing attack and helped quarterback Tony Romo post a career year. But if they want to keep the good times going, they can't rest on their laurels, especially when you consider that Romo will turn 35 this month and a tight cap situation forced them to let multiple pieces walk away this offseason. One of those missing pieces is, of course, running back DeMarco Murray, who left for Philadelphia after racking up an NFL-best 1,845 rushing yards last season. But while many have Dallas penciled in to take Murray's replacement with the 27th overall pick, I actually think the Cowboys would be best served by focusing on defense in the first round. Because while Dallas wasn't as bad defensively as people feared it would be in 2014, it wasn't great, and a number of defenders, including linebacker Bruce Carter, joined Murray in heading out the door this offseason. The Cowboys should look for a corner or a pass rusher and wait until a later round to land a running back, someone like Tevin Coleman in the second round or Duke Johnson in the third. While the backs projected to go in the first round -- Melvin Gordon and Todd Gurley -- are good, I don't know how much better they'd be than someone like Coleman or Johnson behind that Cowboys line. Plus, Dallas did add free agent Darren McFadden -- a tremendous talent who could really be something, if only he can only stay healthy -- to the fold this offseason. The Bucs have so many needs that they conceivably would be better off trading out of the first overall slot and acquiring as much extra talent as they could. Even so, that strategy is not without risk, including the fact that any future first-rounders received would be tied to the fortunes of Tampa Bay's trading partner; consider that if the Bucs were to swap with a team that happened to do well in 2015, they could essentially wind up turning their No. 1 pick into one or more slots in the high 20s, which are not nearly as valuable. The other factor at play: Tampa Bay has a chance to grab a potential franchise quarterback this year, and when you have an opportunity to do that in this league, you have to take it, especially with a less-than-inspiring group of quarterback prospects on the horizon for 2016. Of course, the guy the Bucs are likely to select -- Jameis Winston -- is difficult to figure out. When players fail in the NFL, it often ties back to off-the-field issues, and Winston obviously comes with his share of questions. But then, you also hear that he has great work habits, plenty of smarts and above-average football intelligence. This is looking like a turning point for the Bucs' franchise one way or another; their pick could lift the team into the stratosphere or set the organization back three years. The Saints' window of opportunity is tied to the 36-year-old Drew Brees, meaning they must draft guys who can step in and help right away -- particularly on defense, where they struggled mightily in 2014. The fact that last year's second-round pick, defensive back Stanley Jean-Baptiste, didn't contribute anything as a rookie only amplifies the urgency of the situation. It's never good when you use a selection that high on a guy who was, for all intents and purposes, a complete nonfactor. New Orleans' exceptionally restrictive cap situation makes it that much more important that this team maximizes its draft capital, including its two first-round picks (No. 13 and No. 31). The Saints require a corner first and a middle linebacker second, though they shouldn't overdraft to fill the latter hole. In fact, so great is their need for additional talent, I think it might be worth exchanging that 31st pick for an extra lower-round slot or two. If the Saints are going to turn it around in 2015, it's going to happen largely with players they pick up in the draft.